Research continues into why so many children in the US are overweight and on their way to obesity. A new study from the University of Illinois, published in the Journal of Developmental and Behavioral Pediatrics, links childhood obesity not just to food consumption but to insecure mothers and caretakers. The study’s lead author Kelly Bost, a professor of human development and family studies at the University of Illinois, decided to examine 500 caregivers based on a questionnaire evaluating their attachment in adult relationships along with how they deal with the child’s negative emotion and day-to-day caretaking. What Bost and her team were trying to establish was whether a dismissive parent might be dealing with an “insecure attachment style,” which often leaves children with an inability to function socially and lack of knowledge on how to address their feelings. In turn, the researchers wanted to see what kind of eating habits that confusion elicits through childhood and beyond. “These responses are related to emotional feeding practices like giving children food when they’re upset but not hungry or pressuring them to eat and clean their plates,” said Bost. The side effects from this type of dismissal at an early age aren’t only overeating. The results showed that the neglect causes less social interaction between child and caretaker along with more time in front of the TV, leading to more poor dietary choices. 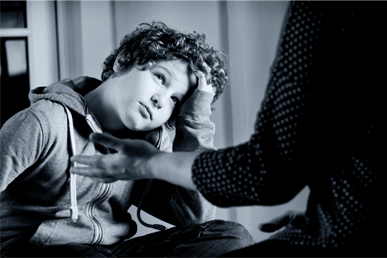 The research brought forth the concern that caretakers were passing their own insecurity on to vulnerable children, albeit inadvertently, due to the stresses associated with parenting: “One explanation might be that insecure moms are more easily overwhelmed with stress, find it more difficult to organize family mealtimes and allow their children to watch more television as a coping strategy,” said Bost. Still, dismissal isn’t the only culprit to the obesity epidemic. Bost and her team also bring to light the dangers of forcing children to “clean your plate” and earn their dessert as a reward. The pitfall being children that don’t learn to respond to their body’s cues, which leads to irresponsible eating habits. “In fighting childhood obesity, one of the most important lessons we can teach children is to eat when they’re hungry and recognize when they’re full. We want to encourage children to respond to their internal cues and encourage parents not to promote eating under stress or eating to soothe,” she added. Bost KK, Wiley AR, Fiese B, Hammons A, McBride B; STRONG KIDS Team.Associations Between Adult Attachment Style, Emotion Regulation, and Preschool Children's Food Consumption. J Dev Behav Pediatr. 2014 Jan;35(1):50-61.